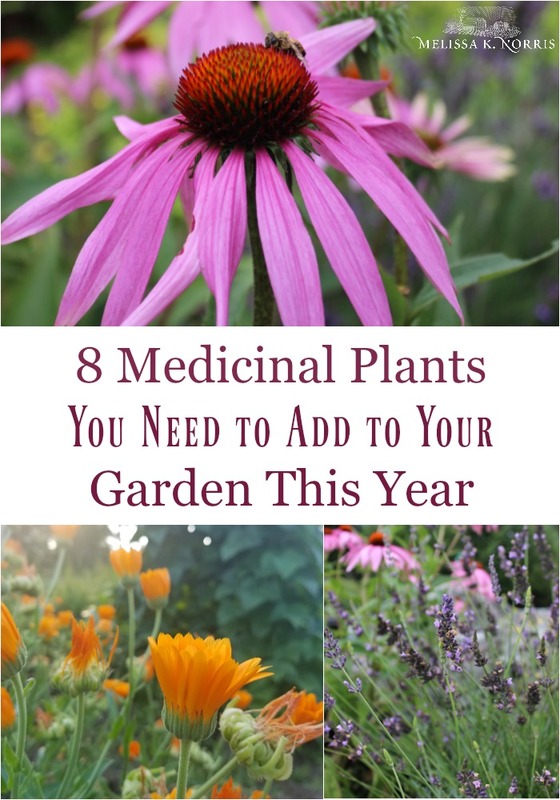 8 medicinal plants you need to add to your garden this year, not only are these some of my favorite power house medicines on the homestead, but they’re beautiful to grow just for appearances. I’ve always focused mainly on food production and the more common culinary herbs, and until just a few years ago, the garden and the majority of my garden planning was always focused on the main food crops. While that’s still important, today we’re going to be focusing on medicinal plants and how to plan to include those in your garden this year. Listen in below to Episode #167 8 Medicinal Plants You Need to Add to Your Garden This Year, of the Pioneering Today Podcast, where we don’t just inspire you, but give you the clear steps to create the homegrown garden, pantry, kitchen and life you want for your family and homestead. Before we dive in though, if you would like more help with planning your food garden, and specifically your food crops, be sure to check out Episode #124 – How to Plan Your Best Garden & Harvest for a Years Worth of Food. If you’re looking to add something new to your garden this year, you might want to consider adding in some medicinal plants and flowers. A couple years ago I decided that, although I want the majority of the plants that I put in our garden to provide us with food or to be useful in some way, ornamental plants and flowers that are simply pleasing to look at also serve a purpose. So that’s when I decided to start adding in flowers that I thought were beautiful and that brought me joy. The bonus is that many of these flowers also have great medicinal and/or herbal purposes. And that’s what we’re going to talk about today. Quick disclaimer: I am not a certified herbalist or a certified nutritionist or medical provider. The following is for educational and informational purposes only. One of my newest favorite medicinal flowers is calendula. I put this in the garden last year and I plan on putting in even more this year. Calendula is a beautiful flower that ranges in colour from orange to yellow. It’s an annual, which means you’re going to need to plant it from seed in the garden each year. But, it’s actually fairly cold hardy and will last well into the fall. It’s also a prolific bloomer, meaning you’re going to get lots of blooms all summer long and into the fall, which is fabulous. And when the flowers dry up, they leave behind the seed pods which are very easy to just crumble off into your hands and save the seed to replant next year. Calendula is also a great addition to a pollinator garden. The bees love it, and of course we always want to attract and help out our honey bees. And finally, it’s got some great useful and medicinal purposes to it too. I primarily use my homegrown calendula for making my homemade salves and balms because it’s great for the skin. I put it in soap, homemade creams, medicinal balms, anything like that. And since it’s a natural colorant, it adds a nice colour to soap without having to add synthetic dyes. So if you infuse oil with calendula flowers and use that in your soaps and salves, etc. you’re going to get that beautiful yellow/orange color come through in addition to it being beneficial for your skin. Next up we have chamomile, and more specifically, German Chamomile. I say this because there is Roman and there is German Chamomile, but for medicinal purposes, it’s usually the German Chamomile that we tend to want to use because of its analgesic, anti-inflammatory, antimicrobial properties, while Roman Chamomile is used more specifically for its calming, relaxing properties. Chamomile is a great plant to grow because, while it is an annual, often times it will reseed itself and pop up again the following year without having to replant. Personally, I haven’t had a ton of luck with mine reseeding itself and then growing again the next spring, so it’s one that I purposely set out to plant. But it’s easy to grow and will do just fine in containers too. You can also grow it in a regular area of your garden. Honestly, chamomile is going to grow pretty much anywhere you want, but you will most likely need to scatter some new seeds to replant it each year. It does best in full sun but mine has done really well where it gets a lot of morning and afternoon sun and then in the later part of the afternoon and in the evening it gets some shade. Chamomile produces a lovely white flower with a pretty little orange, yellow center, sort of like a tiny, dainty Daisy. But it isn’t just pretty to look at, it’s got some great herbal and medicinal uses as well. Most often we think of using chamomile as a tea to help aid in relaxation or to take in the evening to help us sleep, but it’s also really good for topical use as well. Because of German Chamomile’s analgesic (pain relieving), anti-inflammatory and antimicrobial properties, a lot of people use it topically in wound treatments too. 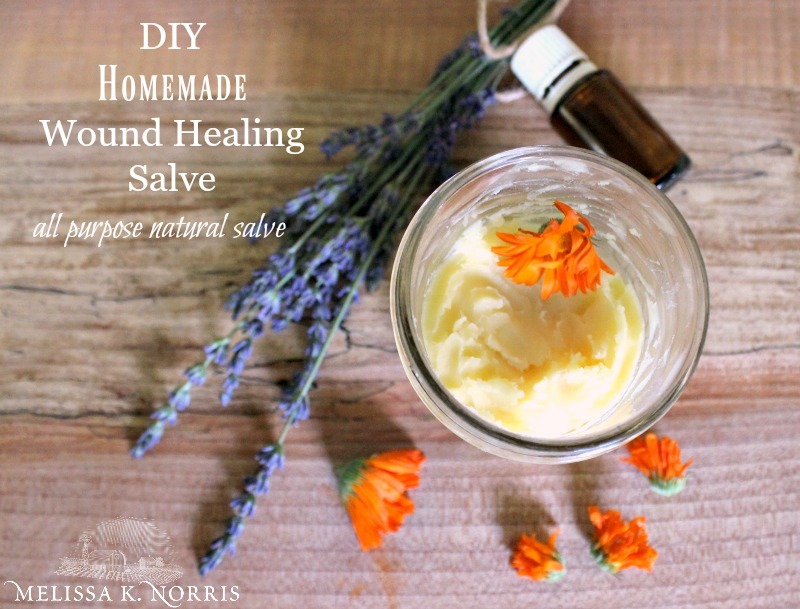 You can use it as a compress or infuse oil and use the oil to make a salve or healing balm. Or, of course, you can dry it and make herbal tea. It’s particularly good when combined with lavender for the ultimate relaxation tea. Next on my list is echinacea. Echinacea is of of my very favorite medicinal flowers to grow because it’s a perennial, which means I only have to plant them once and they keep on providing me with a bountiful harvest year after year after year. So I love perennials both in my flowers and my herbs, as well as with my fruits and vegetables. Echinacea is a beautiful flower and, like calendula, it’s rather cold hardy. So it will send up blossoms in the summer and go all the way into the fall until your first hard frost. And after the plant gets established, you will get some blooms and some flowers within the first year. All parts of the echinacea plant are medicinal, so everything from the roots to the leaves to the flowers. I harvest the blossoms and the leaves -and you can harvest them at any age of the plant- and I make the leaves and flowers into a tincture. The root is typically what we see in things like echinacea tea. You typically wouldn’t want to harvest the root until the plant is at least two to three years old, and you harvest that in the fall after it’s gone through its first hard frost. The bees love this one as well, so it’s a great for attracting pollinators. And of course, medicinally, echinacea is really well known for helping to aid or boost the immune system. Now, you can grow echinacea from seed, but it’s one that the seeds require stratification. Stratification means that the seed needs to go through a cold time, as well as a certain moisture level in order for it to germinate well. So I found it easiest to just go ahead and grab a couple of starts. It’s early enough in the year (if you’re reading this at the time of publication in January) that if you want to try growing echinacea from seed and going through the stratification process, you still have time to do that. But if it’s a bit later in the season or you just don’t want all the hassle, there is no shame in grabbing a few starts from your local garden store. Elderberry is not what we would really consider an herb, but it is a great, powerful, medicinal berry, and it’s a really pretty shrub to have in your landscape. It’s a perennial, which means you’re going to get your elderberry bush, you’re going to plant it and it’s going to (hopefully) grow and provide you with an abundant harvest year after year. Another great thing about elderberry bushes is that you’ll generally get a harvest after just two years, whereas with many of your fruit trees, you’re not going to get a harvest until six or even seven+ years of age. You can make elderberry jelly and jam and you can cook with it. But it’s really known for it’s medicinal properties, specifically in helping the body’s immune system. Elderberry is known as a powerhouse when you’re dealing with different viruses and the flu and that sort of thing, so people will take it during cold and flu season primarily. Now, some people choose to take it proactively. Meaning they’re going to just take it once a day throughout that season to ward off illness and keep everything running smoothly. And then other people prefer just to take it when they first start coming down with symptoms of something. One very important thing to note is that consuming raw elderberries can pose some problems. Now, you don’t ever want to use the bark or the leaves of the elderberry plant. But the berry itself, in most cases best it’s better to cook it first. There’s a compound in there that can have gastrointestinal upset, and that compound is destroyed when you cook it or you bring it up to heat. But you’re not destroying the medicinal properties that are within the elderberry by doing so. For consumption and medicinal purposes and consuming it, you want the variety of elderberry known as Sambucus nigra. They are dark purplish in color. (You want to make sure that you avoid the red elderberries because they are slightly toxic and can result in a stomach ache if consumed). One thing to note before jumping into growing elderberries is that they do best when they have another variety for cross pollination, so I actually ordered two. I got one that has a striped variegated leaf because as I said, I want these to do double duty. I want them to provide things for my family but I also want them to look pretty in our landscape. Then the other variety I got just has a regular green leaf. If you’re interested in ordering your own elderberry shrubs, I ordered mine from a place called Raintree Nursery. This nursery happens to be located in Washington state, where I live, but they will ship all over the U.S. if you want to order them but you live in another state. 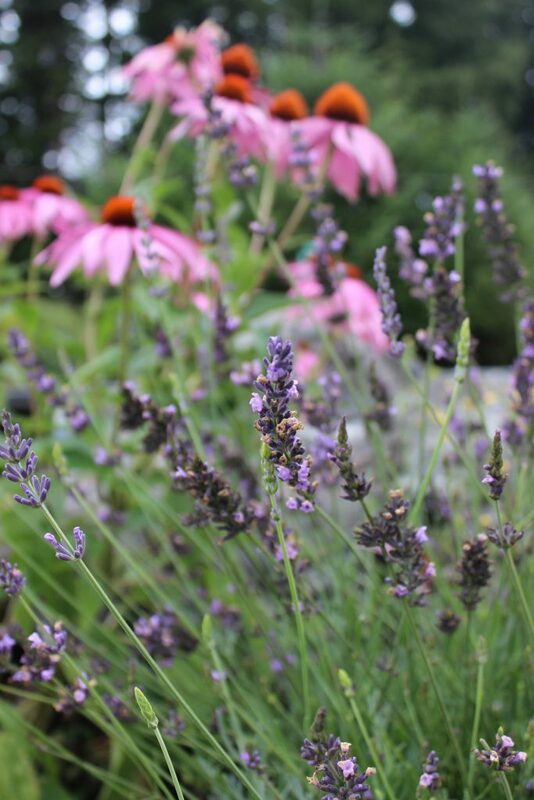 Lavender is one of the very first flowering, pretty herbs that we put in that also has some great medicinal uses. But first and foremost, lavender is really well-known for its strong scent. Interesting side note: I didn’t used to really like the smell of lavender until I smelled real lavender. And what I mean by that is lavender that is not synthetic, as in the lavender “fragrance” that is added to many bath and beauty products. I don’t like the synthetic smell of lavender, but I love the smell of real lavender from the flowers and in essential oil. Lavender is most commonly known for being soothing and calming. It’s also a perennial (woo-hoo! ), so we only have to plant that bad boy once and it keeps on going. It’s drought resistant and likes full sun which makes it pretty easy to grow in most places. It can be pretty hard to start from seed, however. You’re going to have the easiest results in the shortest amount of time if you get a cutting or a start from someone or just buy a small plant. The good thing about lavender is it will grow well in poor to moderate soil. Meaning it doesn’t need a lot of organic, or rich nutrients soil. It also attracts bees, it’s very pretty (and smells wonderful), and if you trim back the blossoms, you will get another large flowering of it. At least that’s been the case for us. So mine will flower, of course in the spring and early summer and then August through September it’s still blooming, so it goes for a long period. Now, once we get that first hard frost, I don’t get any new blossoms, and it will go dormant over the winter months and then come back strong in the spring. Next up on my list is nasturtium. Now, nasturtium is an annual, so you’re going to plant it from seed ever year. But what’s great about nasturtium is that it will grow anywhere. It will grow in small containers, it will grow in flower gardens… I’ve planted it out in the regular vegetable garden to act as a companion plant because it’s a great companion for many different vegetables. Plus, it’s also edible! The leaves and the flowers are edible. So they’re great in salads and make them look really beautiful! You can also throw them in soups for a little bit of a peppery flavor. Plus, nasturtium has also been shown to have antimicrobial and anti-inflammatory properties. Now, I generally don’t dry and use them in teas or anything like that, we just use them in our fresh eating. The final plant on my list today is sage. Sage is one of my very favorite plants. I love the sage leaves: they’re almost velvety to the touch! And they’re a very pretty silvery green. It’s also a perennial, so once you plant it, it’s going to keep coming back..
One of the best things about sage is that I can still go out right now (in January) and harvest a few sage leaves. Now, I’m not getting any new sage leaves, but whatever was growing, it just gets halted when the really cold temperatures and hard frost hits. Then in early spring it will start producing again. Sage is one of my favorite herbs to use in cooking. Medicinally, it’s also an herb that I always grab and add to tea whenever I start to feel a bit of a scratch or I need to help soothe my throat. So as you are planning your garden and deciding what you’re going to put in, definitely consider adding in some of these medicinal flowers and herbs to your garden this year. They easily slip into your existing landscape and most of them will grow just about anywhere. So even if all you have is a small balcony, you can still grow most of the plants on this list! Have you already grown some of the flowers and herbs on this list? How do you use them around your homestead? Will you be planting any new varieties this year? I’d love to know so let me know in the comments!